I was happy to get a copy of The Ciao Bella Book of Gelato and Sorbetto, because perfecting cold things like ice cream, gelato, and sorbet are on my to-do list for the year. The recipes in the book span from the predictable and expected to the creative, the type where you want to make them just to taste what it might be like (black sesame!?). I chose to try the nocciola (hazelnut) gelato because I have a big bag of Oregon hazelnuts in my freezer that I'm always looking for a recipe for, and I wanted something that was a little more "authentic." It was a few extra steps to prep the hazelnuts, but the end result had so much flavor, I'd say it was worth it. There are two base recipes in the book for gelato (regular and chocolate) and this was a good example of the plain base. I also wanted to play around with a sorbetto recipe, because I hadn't yet tried anything non-creamy in my ice-cream maker. Mangoes looked terrific at the store, so mango it was! 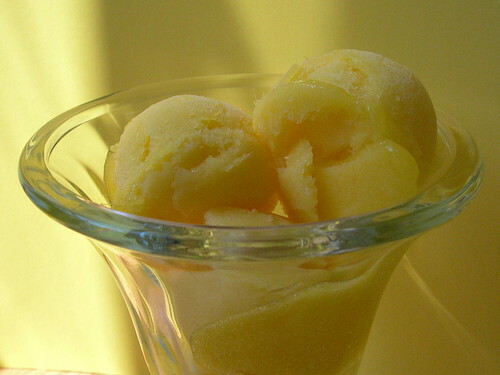 The sorbet(to) was full of fruit flavor, which makes sense since it was simply mangoes and simple syrup. I'm still learning how long to leave mixtures in the ice-cream maker before putting them in the regular freezer for a few hours, and I think I've decided that stopping around 25 minutes where everything is still a bit soft, and not as much has hardened on the sides, is the best strategy. 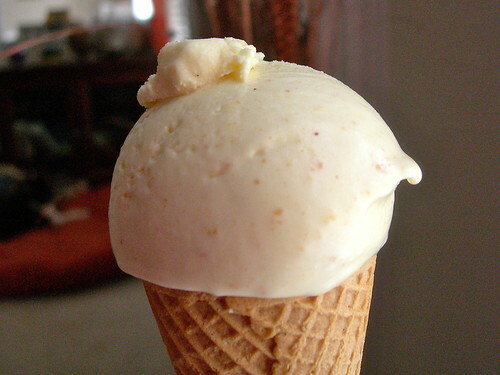 That is what I did with the gelato and it was still soft and creamy a few hours later from the freezer. I'm sure you'll see more recipes from this book throughout the summer. I was very happy with the simplicity of the plain base, and there is so much room to be creative with it! I also want to try granita, which there was a chart for at the end of the book. If the name sounds familiar, Ciao Bella is pretty standard in grocery stores these days. But you can't beat the taste of making it at home (plus it is cheaper in the end!). A co-worker is moving north, and we decided her going away party should be all southern food. 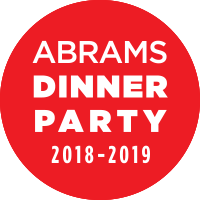 I'm not sure what dessert says southern food more than red velvet cake, except maybe banana pudding (which was also present!). But I didn't want to make cake. 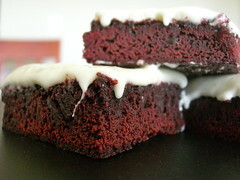 I decided to try to make red velvet brownies instead. This is my own recipe, combining a few recipes together, so please credit me if you post it. Melt butter in microwave with corn syrup until you can easily stir them together. Set aside. Put eggs, sugar, salt, cocoa, vanilla, and baking powder into a mixing bowl. Beat at medium speed for 3-4 minutes, until smooth and viscuous. Add corn syrup and melted butter mixture and mix on low speed for one minute. Mix in flour. Slowly add dye/water mixture and mix for about one minute. Scrape down bowl. Pour batter into a greased 15x10x1 inch baking pan (otherwise known as a "half sheet" pan). Bake at 350 degrees for 25-35 minutes or until a toothpick inserted in center comes out clean. Frost with icing and cut into squares. Makes 3 dozen 2" square brownies! I resolved back in January to be more intentional about baking with seasonal ingredients, and then almost missed rhubarb season! That would have been a shame. It isn't as if I haven't played with rhubarb before. There were crisps, muffins, coffee cakes, and even mousse, but I had neglected what most people think of as standard rhubarb fare - the strawberry rhubarb pie. I have always been skeptical of strawberry rhubarb pie. I'm not afraid of rhubarb and its tartness, and always thought strawberries were trying to cover it up. Just the same, I went on a hunt for a recipe. The only ones I could find were regional midwestern cookbooks, and I found several good looking recipes from Wall Drug in South Dakota, and The Black Hills Rosemalers Recipes book. I skipped the one that included maraschino cherries, despite its claim to being a "State Fair Award Winning Recipe." 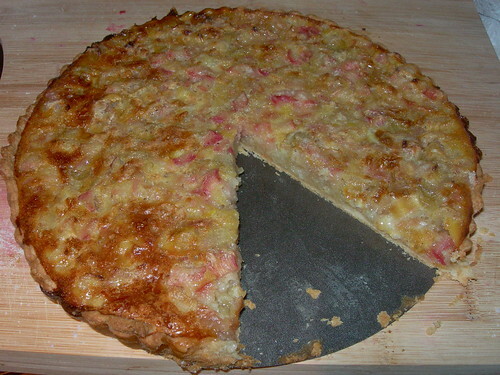 I ended up with enough leftover rhubarb and crust either to make a few little tarts or one large tart, barely. So I decided to try the Rhubarb Custard Pie recipe from the Black Hills cookbook, with a few modifcations. Mainly I cut the recipe in half, cooked it in a tart pan, and didn't add a top crust. It had intrigued me originally but I felt obligated to do the standard pie first. I'm glad I got to do both, because this is the one I'd make again in a heartbeat. The sweet custard is a beautiful taste pairing with the sweet-tart rhubarb. 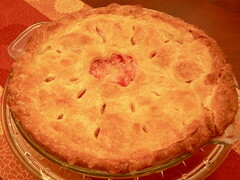 I'll include the original recipe, and you can do what I indicated above if you want to try making it in tart version. Make pie crust for 2 crust pie and line 9" pie plate. 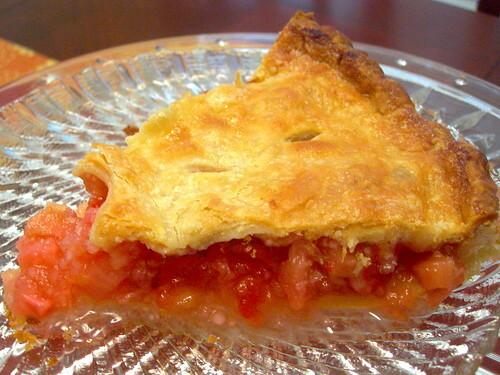 Mix rhubarb, sugar, and flour and put in pie tin. Beat eggs and milk slightly and pour over rhubarb mixture. Put on top crust or lattice top and dot with butter. Bake at 400 F for 50-60 minutes or until nicely browned. After 25 minutes, reduce heat to 350. 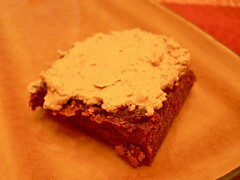 Here it is, the ocho de mayo, and I haven't yet blogged these brownies. My new guilty pleasure food show is What Would Brian Boitano Make? He makes food that isn't difficult, and it is funny to see what he dumps into a bowl and calls it a teaspoon. (It isn't supposed to be funny, but he is way off!). He made Fudgy Gooey Brownies on a recent episode, and I liked them because they included ancho chili powder, cayenne pepper, and coffee. They also included salt sprinkled on the top. I believe I have already ranted at least once about this salt trend that I hate, but to paraphrase no way was I adding salt to my brownies. Even the kosher salt used in the recipe instead of regular made the salt a more prominent flavor than I would have liked. I don't get this trend, can't wait for it to pass! Living in the south and not wanting to wait on a mail order, I couldn't find chili powder that was ancho-specific and chili-only. Here chili powders come with garlic and onion, and I just couldn't see that being very good in a brownie. So I omitted the chili powder, used the cayenne pepper, and doubled the espresso powder in the recipe. The one in the picture has coffee buttercream on it, an experiment i did but ultimately I thought they were best plain. I had a few funny reactions from people who didn't read the sign and were not expecting spice. The funniest comment I got was, "I think something might be wrong with me but my tongue has been on fire since I ate one of your brownies!"